France, 2005, 100 minutes, Colour. Andreas Wilson, Emma Griffiths Malin, Diogo Infante, Ed Stoppard. 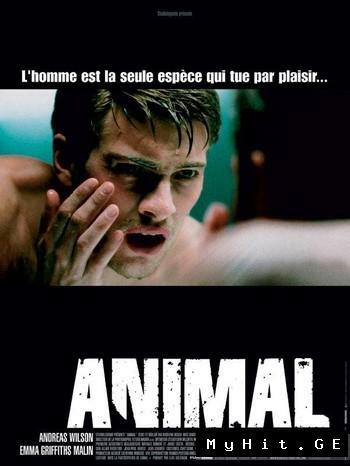 Animal is a futuristic science fiction film with echoes of Dr Jekyll and Mr Hyde. It was written and directed by Roselyne Bosch, producer and writer (1492). This is her feature film debut. The film presents work in an unnamed European university with lavish scientific facilities. A Swedish scientist is employed as a molecular biologist and has discovered a way of altering genes, so that he can eliminate the genes responsible for human aggression. He has been researching on animals – and when a wolf escapes and does not attack people, he teams up with an animal keeper to take the wolf back for further research. But, as with Stevenson’s story, the sincere scientist is a victim of his own and society’s hubris. He wants to test his theories on a human subject and decides to experiment on himself. In the transformation, he becomes a menace to his now girlfriend and threatens her. He also behaves erratically, killing the laboratory chief and is appointed in his place. When things get out of hand, when deaths are discovered, he is confronted – and escapes into the mountains. The film is interesting in terms of films about scientific development, about bioethical issues. It also serves as a thriller – and is filmed in interesting surroundings both in the university and in the mountainous countryside. There is some hope at the end – but, as with all good science fiction films, there is a cautious warning that this kind of accident and this kind of abuse of authority could happen again. 1. A film about science, the near future, fiction or fact? 2. The title, the animal in humans, the animal nature in nature? The image of the wolf at the beginning, the experiments with the wolf, aggression, non-aggression – the scene in the department store with Santa Claus? The shooting of the wolf? His regaining his aggression? Going out into the wilds? The experiments in laboratories with animals? Humans testing themselves? 3. The Portuguese settings, the Pyrenees scenes? The ultra-modern facilities, interiors and exteriors? The celebration of New Year’s Eve? The musical score? The setting as generally European, combining many elements? 4. The international cast, the film made in English? 5. Thomas, his age, his experience, studies? Swedish background? His love for his sister, the Hunter and his attack on her, her blindness, Thomas and his care of her? His motivations for his experiments? His working with his assistants, the girl and their relationship, her giving up on him? Julius and his friendship? The new boss, his dominance? The issues of grants and research? 6. Audience knowledge of DNA, scientific experiments, the work of biologists? Biologists and their looking at facts, the human system, not interested in the soul or consciousness? The film as beginning like a modern Frankenstein story and turning into a Dr Jekyll and Mr Hyde story? 7. The Hunter, as a person, the collage in his room about his serial killings, violence, the women? His attitude towards killing, towards the women? Sexuality? His being lucid, rational? Tough? His life in the prison, the comforts, the suntan etc? The visit by Thomas, his scepticism, the nature of the tests, his fear of needles, the needle in the eye? The prospect of his changing? His being unwilling, the actual change? The advances of the doctor in the prison, his tying him up and escape, the disguise, walking out of the prison? Going to the New Year’s Eve fair, the attraction of the girls – but his not being able to attack them? His going to visit Marie, his sparing her, wanting someone to tell the story, his compassion for her? His attitude towards Thomas, wanting him to change, keeping the syringe? Taking the image of the dancer, going out, the confrontation by the police, his death? 8. Thomas and the wolf, seeing it on television, phoning Justine, meeting her, going with her to set the wolf free – and the irony of its later coming back, seeing him on the road, the attack, and his crash? The relationship with Justine, sexual? The Hunter and his taunt? The Kendo training and his defeats, the transformation and his defeating his boss? Their confrontation, doing the deal, the boss wanting the finance and profits? Going into the pit-bull area, his being mauled and his dying? The funeral? Thomas being appointed the new man in charge, his arrogance towards people, Julius and his confronting him and leaving? 9. Going with Justine into the forest, their relationship, the storm, the news about the Hunter being free, his manic driving, Justine getting out and returning with the truck, Thomas pursuing the Hunter through the fairgrounds, the Hunter disguising himself? His going to the laboratory, the countdown to the transformation of the blood? His burning the laboratory? 10. The confrontation with Justine, threatening her, his jealousy? Their driving to the border, the wolf, his crash? 11. The irony of the woman in coma, her needing the blood transfusion, his blood being judged as clear, the transfusion – and seeing the woman afterwards? Kind? His sitting on the cliff, his diary? The trying to assess what he had done? 12. The character of Justine, her work with the wolves, loving nature, attracted towards Thomas, her being invited out by the boss, the relationship with Thomas, going into the forest with him, her fear, his manic driving, the final confrontation? 13. The scientists, the boss and his greed, profit-making? Experimental companies and their takeovers? The appointment of heads, research assistants, grants? 14. The film as science and science fiction? The transition to thriller? How effective the combination of each genre?